COMPASS Wealth Management, LLC’s approach is client focused. We listen, consult, and assist you in making the decisions that are best-suited for your organization. Solutions are tailored to your organization’s needs—not a boilerplate, one-size-fits-all approach. In consultation with your investment committee or other responsible party, COMPASS designs an appropriate asset allocation strategy for your portfolio based on several factors, including its purpose, projected cash flows, investment time horizon, and the organization’s risk tolerance for its investments. 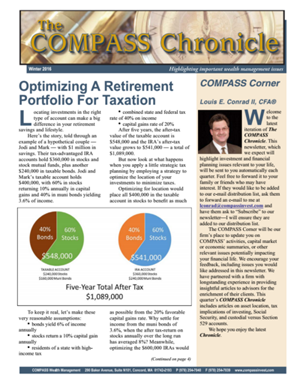 Once an asset allocation strategy is determined, COMPASS recommends a diversification mix to help manage the portfolio’s risk level. The agreed to asset allocation and diversification structure is then immortalized in an investment policy statement, which outlines the responsible parties, performance objectives, risk parameters, and other factors. If you also engage COMPASS to provide discretionary investment management services, then COMPASS will manage your portfolio consistent with the investment policy statement. Whether you engage our investment management or investment consulting services, we schedule regular meetings with your organization to review your portfolio’s performance, structure, and other metrics. COMPASS accepts management of existing portfolios of individual securities, but normally will purchase open-end mutual funds and exchange-traded funds when investing cash. We have access to institutional shares of mutual funds, which offer meaningfully lower expenses than have been available historically. Depending on the portfolio’s asset base, separate accounts managed by third-party money managers may also be implemented. In either case, accounts are held at the institutional arm of a leading third-party custodian. COMPASS provides a variety of objective and independent consulting services, which we call our Fiduciary Advisory Service. This service is designed to meet your needs as a plan sponsor. We work with you as a co-fiduciary in meeting your obligations to plan participants. For example, we review your present investment policy statement for completeness and appropriateness, or craft one for your acceptance. The statement provides guidelines for the oversight of your plan, including how investment decisions are made, the roles and responsibilities of the parties involved, and the ongoing review process. We meet with your investment committee on a regular basis to address investment and other issues and document the decisions that are made. Our goal is to provide you with the most cost-effective options for your benefit dollars with full fee transparency. Whether you need our assistance in conducting a search for potential service providers or seek to reduce the fees you pay, we provide you with solutions. In addition, when evaluating investments for your plan, we are focused on providing your participants with the best choices on an after-fee basis. We evaluate your plan’s current investment line up and assess whether your plan has asset class and style overlaps or gaps, and whether your present investments have performance or other issues of concern. We follow strict quantitative and qualitative criteria in selecting investments to ensure that your plan has a superior and well-balanced offering. Our goal is to provide your plan with investments that generate consistently superior performance relative to their peers. Once selected, we monitor each investment’s attributes to verify their compliance with the investment policy statement. Despite a plan sponsor’s best efforts, too often retirement plans are underutilized by the employees for whom they are established. We strongly encourage plan sponsors to implement a regular, ongoing education and communication program for all eligible employees. For defined contribution plans, we assist you with an enrollment campaign. We are available to provide educational seminars to employees on a variety of topics from investments to retirement planning to education funding. We even provide investment advice to plan participants on a one-on-one basis. You may find this to be an especially attractive benefit for key employees.